PEOPLE in Hanham paid their respects on Armistice Day to those who have fallen in the line of duty. The annual service at the war memorial at Hanham Community Centre drew hundreds of men, women and children who wore their poppies with pride. This year's service was particularly poignant as it marked the centenary of the end of the First World War. 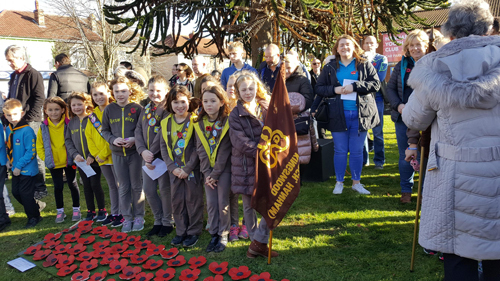 Wreaths from various organisations and individuals were laid including ones from the Royal British Legion, the Labour Party, MP Chris Skidmore, South Gloucestershire Council, Hanham and Hanham Abbots parish councils, Hanham Youth Centre, Hanham History Society and Hanham WI. Clay poppies made by various local scouting and guiding groups were placed along the walkway leading to the memorial. The service was conducted by the Reverend Peter Cook from Hanham Baptist Church with several other church representatives addressing the audience and leading prayers, tributes and hymns. The Last Post, played by young trumpeter Matthew Mackerras, was followed by a two minute silence. The Reverend James Jang, from Hanham United Reform Church, remarked on how pleased he was to see so many people turn up to pay their respects. Following the service, refreshments were served in the community centre.